Most of the body's cells communicate with each other by sending electrical signals through nano-thin membrane tubes. A sensational Norwegian research discovery may help to explain how cells cooperate to develop tissue in the embryo and how wounds heal. For nearly ten years, researchers have known that cells can "grow" ultra-thin tubes named tunnelling nanotubes (TNTs) between one another. These nanotubes -- the length of two to three cells and just 1/500th the thickness of a human hair -- are connections that develop between nearly all cell types to form a communication channel different from any previously known mechanisms. In 2010, Dr. Xiang Wang and Professor Hans-Hermann Gerdes -- colleagues at the University of Bergen's Department of Biomedicine -- discovered that electrical signals were being passed through nanotubes from one cell to another at high speed (roughly 1-2 m/sec). Their research receives funding under the Research Council's large-scale research programme Nanotechnology and New Materials (NANOMAT). In their key experiment, Dr Wang used fluorescent dye that changes in intensity as the electric potential of the cell membrane changes. When two cells connected by forming a nanotube, he poked into one of them with a microinjection needle to depolarise that cell's membrane potential. This caused the fluorescent indicator on the cell membrane to light up like a firework, and it was soon followed by a similar light display in the cell on the other end of the nanotube. "We confirmed that this is a common phenomenon between cells," explains Professor Gerdes. "Still, this characteristic is not in every cell type." The experiment was replicated a number of times to obtain statistically reliable data. The electrophysiology group at the University of Bergen took precise conductivity measurements of the cell systems to determine the strength of the electrical coupling. In autumn 2010 the results were published in Proceedings of the National Academy of Sciences (PNAS). "It is truly painstaking work," says Professor Gerdes. "You may sit there examining cells for hours through a microscope without seeing a single tube. If you are lucky, however, you catch sight of a nanotube being created and can film the event." He also found that in some coupled cells voltage-gated calcium channels were involved in the forwarding of the incoming signals. When the electrical signal being sent through the nanotube reaches the membrane of the receiving cell, the membrane surface is depolarised, opening the calcium channel and allowing calcium -- a vital ion in cell signalling -- to enter. "In other words," explains Professor Gerdes, "there are two components: a nanotube and a gap junction. 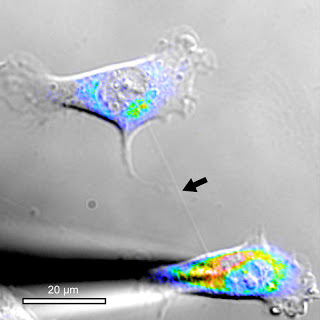 The nanotube grows out from one cell and connects to the other cell through a gap junction. Only then can the two cells be coupled electrically." "It's quite possible that the discovery of nanotubes will give us new insight into intercellular communication," asserts Professor Gerdes. "The process could explain how cells are coordinated during embryo growth. In that phase cells travel long distances -- yet they demonstrate a kind of collective behaviour, and move together like a flock of birds can." The Bergen-based neuroscientists see this research as an opportunity to formulate better explanations for phenomena related to consciousness and electrical connections in the brain. In the project "Cell-to-cell communication: Mechanism of tunnelling nanotube formation and function," they are now studying precisely how nanotube mechanisms function in brain cells.